As a young lad, Ted Colbert played with chemistry sets and taught himself how to program on a Commodore 64, an entry-level computer that was hugely popular in the 1980s. A few decades later, with a love for engineering and IT and a stack of experience under his belt at AT&T Bell Labs, Ford and Citi, the American landed the plum yet highly challenging role of CIO at $96 billion aerospace and defence giant, Boeing. Today, Colbert is responsible for IT strategy, operations and processes at the world’s largest aerospace company, and one of the top manufacturers of commercial aircraft and defence, space and security systems. There are more than 6,000 IT staff in his team. Colbert is leading technology transformation initiatives at Boeing which will play a big part in preparing the 100-year-old global organisation for its second century of operation. Last week, Colbert was visiting IT teams in Australia, which is the organisation’s largest footprint outside the United States. “There are some amazing products that we deliver in the locations here in Australia,” Colbert tells CIO. Australia provides a small yet very agile environment to test out and implement solutions that are used by the global organisation, he says. Colbert describes being at the helm of a big piece of an organisation that has been around for 100 years as an ‘awesome’ responsibility. “You have to put in place things that maybe 20 years from now, people will look back and think, ‘how in the world did these guys think about this?’” he says. “We look back 20 years and we see people doing punch cards and other interesting stuff and they would have never imagined we would be where we are today,” he says. Boeing is leveraging what Colbert describes as “the digital thread of data” that flows through the lifecycle of the aviation company’s products at each stage. A key part of this is providing a feedback loop throughout the system to make its products better, deliver them faster and ensure manufacturing is easier and safer for its many thousands of employees. “And we need to be supporting our customers with insights to help them run their businesses more efficiently. That big area of design manufacturing is very significant. “In our services business, [we need to ask] how do we take more market share? What are the future solutions that our customers will need? Safety, productivity and quality are all inextricably linked – how do we take the company a step function forward there?” he says. “So I have an effort that supports all of those big objectives around second century enterprise systems and that takes a look at – in the industry we would say it’s a digitisation strategy – but it’s more than that. It’s saying, ‘what does the digital core of the company look like when we talk about traditional ERP, manufacturing, execution, operations management, and product lifecycle systems?” Colbert says. Colbert says work is being done to drive commonality and simplification and remove some of the fragmentation in the digital core of its commercial and defence operations to drive innovation across the business. Information management and data analytics is indeed a big part of Boeing’s transformation strategy. So much so that Colbert became senior VP of information and analytics earlier this year in addition to his CIO role. To put things into perspective, there were around 100 sensors in the nose cone of a Boeing aircraft built in the 1960s. Today, there are many thousands of sensors spread across the planes that create a vast amount of data that can be used back in the design/manufacturing lifecycle, and with its customers. “There’s data in the design and engineering process, there’s data in the manufacturing process that comes out of machines and out of execution, quality and certification systems,” says Colbert. This information is being used to predict part failure, and when maintenance needs to be scheduled as well as help with crew scheduling and aircraft health management. Colbert says there are many applications of data analytics that represent opportunities to drive productivity from within the company and support the efficiency and safety of its customers. Boeing is making a move towards rolling out cloud architectures, says Colbert. Globally accessible and scalable cloud platforms are being used when required by its development, production and operations teams. “We have partnerships with folks who have platforms around the world that we plan to leverage that will look like hybrid cloud architectures – very secure capabilities with our customers,” he says. Boeing’s services business, which delivers parts, maintenance and engineering and flight operations solutions, lends itself to a software-as-service model, he says. Currently, more than half of Boeing’s order backlog for commercial and defence products is coming from outside the United States. Colbert started doing engineering work in his first summer out of high school when he landed an internship with a local utility in Baltimore, north of Washington D.C. He spent his university years working at an AT&T Bell Laboratories’ factory that manufactured glass for fibre optic cable. At the time, the Internet was booming and the factory couldn’t make enough glass to support the demand for the cable. Using his engineering background, Colbert built simulations and models of the factory and made some recommendations on how to improve efficiency. He was also asked to create a tool that enabled the organisation to view what was being produced on the factory floor. After completing a Bachelor of Industrial Engineering at Georgia Institute of Technology in 1996, Colbert had job offers from companies in the traditional industrial engineering sector but also in IT. 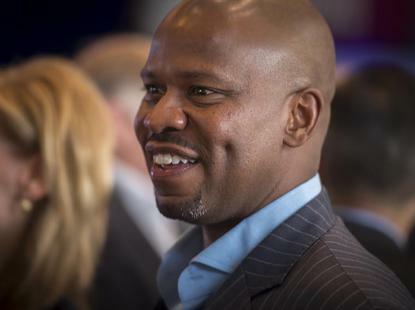 Colbert then took his background in industrial engineering to Ford where he was part of the automotive giant’s ‘employee rotational program.’ He spent nine years between 1998 and 2007 at the company in various roles. Colbert then moved into financial services at Citi as senior VP of strategy and planning, and as senior architect. Colbert arrived at Boeing in October 2009 to undertake more operational roles starting as director, enterprise network services, before moving into the roles of VP, IT business systems in 2010 , VP, information technology infrastructure in 2011 and CIO in November 2013. He describes his current role as unique yet quite tough. “Being in the middle of an evolving 100-year-old company and continuing to demonstrate our place as an innovative leader in the world – a global industrial enduring champion, is a tough role. “When I talk to my peers in the industry, they are always interested in the broad set of challenges that I have as a CIO. I am very fortunate to have the role. I have learned over the years that there are definitely patterns in the way technology is implemented and how we look at organisations and standards and drive innovation,” he says. Colbert says an exciting part of his career has been his ability to solve big problems by leveraging improved processes and technology. “Things have evolved over time and fundamentally, what I have seen even back to my first internship where I was doing manual, intern type of work, technology has become more efficient, gotten better and faster and the ability to apply it to problems follows suit with that largely,” he says. Colbert has spent time championing diversity across Boeing and he encourages the development and growth of the pipeline of talent in STEM fields from high school through to college. He is the executive sponsor for Spelman College in Atlanta, Georgia, a small, historically black college for women. “At Spelman, one of the programs we sponsor is around robotics. That’s for college students but there is also reach back in to the grade schools to help with the STEM pipeline,” he says. Colbert admits that women and minority groups are poorly represented in positions of leadership across many organisations. But he says in the US, there are many initiatives at corporate and government levels that are helping to stimulate the pipeline. “There’s more to be done, we [Boeing] do a lot and our parent companies do a lot but there’s a lot of reach into disadvantaged communities to really stimulate the curiosity of children in the STEM fields,” he says. In 2015, Colbert was named as a member of the Ebony Power 100, a list that includes not only business leaders but entertainers who are famous the world over, the likes of Prince, Janet Jackson and Regina King. “I am super humbled to be part of the list,” he says. “I just consider myself a person who just wants to do a good job, work in a great place and make a difference. If that helps to influence and encourage a young person or someone who is pursuing this field and is having a hard time sticking to it, then that’s all that matters to me. “It’s not about me, it’s about recognising that there is a path, and that the company I work for is innovative, smart and we make amazing things,” he says.